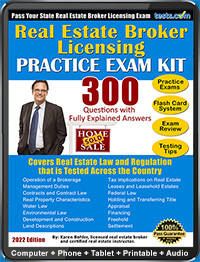 What: The broker exam is designed to guage one's knowledge of real estate broker practice. Who: Real estate professionals (particularly agents or salespersons) who wish to be licensed brokers and have the option of managing their own firms. Where: Local schools, colleges, and private test administrators can act as test sites. When: Upon fulfilling the necessary educational and occupational requirements, a real estate professional may apply to take the broker exam. How: Contact Pearson Vue, Psi Exams, or your state's department of real estate in order to obtain information on teset registration. Type: Broker exams are multiple-choice and computer based. Why: A broker's license implies the holder possesses a greater amount of knowledge and experience than an agent or salesperson. Time: The broker exam can take a maximum of five hours. Language: States require that brokers be highly proficient in English; therefore, exams are in English by default. Preparation: After completing the required educational and work hours, you can prepare for the broker exam more specifically via sample tests online and exam prep booklets. Cost: Due to disparities among states, exam fees usually range from $50-$200. Real estate brokers are more than salespersons; brokers represent the interests of both buyers and sellers and attempt to assist each party through the process of transferring property while ensuring the most favorable outcome for each party. Generally, becoming a licensed broker involves considerable work experience as an agent or salesperson because brokers must be knowledgeable enough to work independently and seek out potential buyers and sellers. According to the Bureau of Labor Statistics, an important distinction between agents or salespersons and brokers is that brokers are licensed to run their own businesses and agents must work under a broker. The following guide to broker exams is specific to brokers, though the labels agent, salesperson and broker are often used interchangeably in informal situations. In the United States, all practicing brokers are required to be licensed by the state in which they practice. This ensures buyers and sellers that the broker has the work experience and the education to fully understand the complicated work of real estate transactions. A broker license is proof that one is familiar with important details such as real estate law and property valuation. 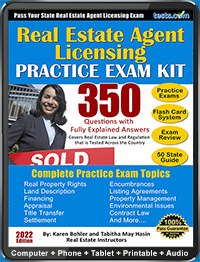 Because real estate broker exams material is determined by the licensing state, the details of the tests vary considerably. For example, the California Department of Real Estate lists Laws of Agency, Valuation and Market Analysis, Property Ownership and Land Use Controls and Regulations, Transfer of Property, Financing, Practice of Real Estate and Mandated Disclosures and Contracts as possible examination content areas. In all states, the broker exam is computer-based and multiple choice. Generally, in order to pass the exam, one must get 70-75 percent of the questions correct. Exams include around 120 questions and can take up to five hours. Tests include a General Content section of 80 questions and a state-specific section of 40 questions. Individual states have very different exam registration requirements. Many states contract their testing needs to either Psi Exams or Pearson Vue. Candidates should check with their state licensing board to find out exactly who will administer the exam and where to register. Broker exam fees range anywhere from $50 to $200, depending on the state and the specific test administrator. The broker exam is generally somewhat more costly than other exams because it tests a greater range of knowledge. An aspiring broker can prepare for the real estate broker exam in a number of ways. First, most states have a training and education requirement; the Bureau of Labor Statistics estimates that one must have between one and three years of work experience and between 60 and 90 educational hours. The education requirement may be met by taking college-level courses in areas like finance, law and business administration, as well as in real estate-specific courses. Despite the great variation in broker examination requirements, licenses can usually be transferred from state to state. However, one cannot practice in a state until your license from the previous state is fully approved and transferred. For more on real estate tests, please visit our Real Estate Broker Test Directory.